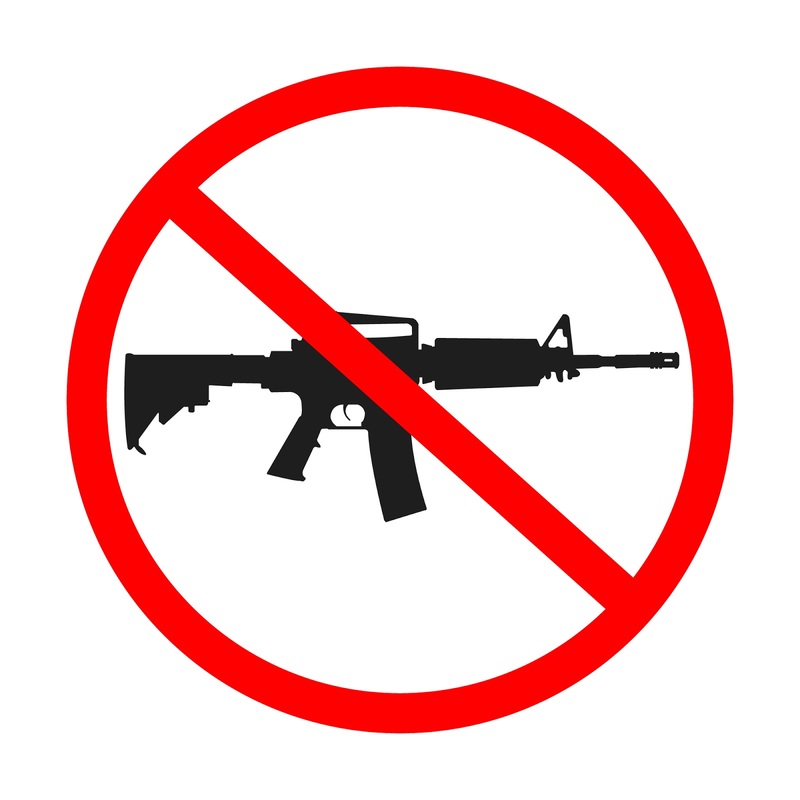 Let's talk about gun laws and why they matter. California has seen a bigger decrease in gun deaths and injuries than the nation, on average. Much of this can be attributed to their strict gun laws. New York has one of the lowest number of gun deaths and injuries in the nation. 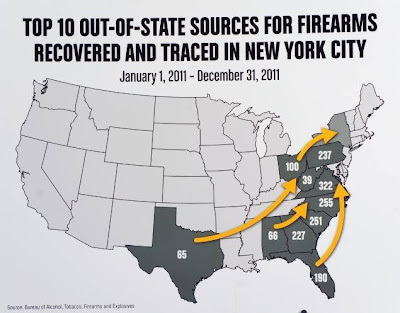 But the guns are coming from states outside of New York which contribute to the number of shootings in NYC. Large urban areas have larger numbers of gun crimes and gun deaths for obvious reasons. Or, at least, they should be obvious to most. But the gun rights extremists just love to pluck out the stats for the large cities in states that have strong gun laws and say, "How about L.A. or NY. Why do they have so many shootings if their gun laws are so strict?" Simple. Guns come into New York from the Iron Pipeline- from states where gun laws are looser than those in New York. And yes, there is a gaping loophole in sales of guns on the Internet with no background checks. This would close if our Congress members get up their courage and do the right thing. Let's take a look at more about the above examples. Over the last twenty years, the number of people injured or killed by guns in California has decreased dramatically. In 1993, 5,500 Californians were killed by gunfire; by 2010, the most recent year for which data is available, that number had dropped to 2,935.3 In just two decades, the state’s gun death rate has been cut by 56%, a reduction that translates to thousands of lives saved every single year.4 (...) see chart about these statistics. New Yorkers can thank Congress and other state legislatures for much of the gun crime that occurs in the city, Mayor Michael Bloomberg said on Wednesday, citing new statistics from the Bureau of Alcohol, Tobacco, Firearms and Explosives showing that 90 percent of traceable guns used in crimes in the city in 2011 came from out-of-state. That figure is up from 85 percent in 2009. While touting the steadily dropping number of shootings and murders in the city—almost 30 percent fewer than last year’s record low—as an indicator of the NYPD’s success in keeping the city safe, Police Commissioner Ray Kelly said there’s room for improvement to come from outside the state. “We could do even better if Congress helped with meaningful gun control,” Kelly said. Last year, the greatest number of out-of-state guns used in city crimes came from Virginia and North Carolina, two states which the mayor’s advisor John Feinblatt said not only don’t have background checks for gun sales, but recently rolled back some of the gun control laws they did have in place: North Carolina now allows guns in bars and educational institutions, for example. “Unfortunately, each of the states on this list and very weak and don’t have any of the laws that we think make a difference,” Feinblatt said. Bloomberg noted that the top 10 point-of-origin states all have private sale loopholes in their gun control laws, which allow private dealers to skip background checks. The study focused on Armslist.com — a popular classified site similar to Craigslist.org that facilitates private sales of firearms and ammunition based on location — and analyzed listings in 10 states where senators voted against a background-check compromise this spring. At any given time, more than 15,000 guns were for sale in those states, according to the study, and more than 5,000 of them were semi-automatic weapons. Nearly 2,000 ads were from prospective buyers asking to purchase specifically from private sellers, where no background checks are required. “At this point, this is the biggest loophole in the background check system,” said Lanae Erickson Hatalsky, director of social policy and politics at Third Way, an organization that has been active in the gun-control movement for years. Background checks — designed to keep guns out of the hands of convicted felons, domestic violence perpetrators or the severely mentally ill — are mandatory for gun sales at retail stores, but not at gun shows or for private sales, such as between neighbors and family members or between individuals online. 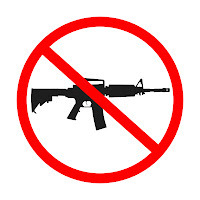 The National Rifle Association and other gun rights supporters have advocated against expanding the background check system because they believe doing so would not stop society’s most dangerous people from procuring weapons and eventually would lead to even stricter gun regulations, including a federal registry. The NRA, in a policy statement on its Web site, notes that most firearms sales online go through a federally licensed firearms dealer in the home state of the buyer. “The reality is that the Internet does not provide any legal opportunity to simply buy a firearm as if it were a pair of jeans,” the statement says. But most firearms sales facilitated at classified sites including Armslist.org do not go through dealers because they are person-to-person transactions, Hatalsky said, meaning the buyers do not undergo background checks. Gun-control advocates have long prioritized closing the gun-show loophole, believing that is where people seeking to avoid background checks buy their firearms. Hatalsky noted that 17 states have closed the gun-show loophole in their states, and that law enforcement officers have become savvy about scouring gun shows for people evading the law. We know that shooters have purchased guns from Armslist.com. The Milwaukee spa mass shooter got his gun there. A domestic abuser- no background check. A Minnesota woman who shot her ex partner got her gun there. History of restraining orders. No background check. The gun rights extremists make all kinds of specious claims that sales on the Internet require background checks because people who buy have to pick up their guns from Federally Licensed Firearms Dealers. Famously, of course, the Virginia Tech shooter, Cho, bought one of his guns that way. He should have been on a prohibited purchasers list but tragically he wasn't. The law requiring the reporting of dangerously mentally ill people like Cho was passed after that shooting. Gun laws matter. ( some states are still not reporting enough names to the system) But I digress. Some sales on line require pick-up at a licensed gun shop. But gun rights extremists are wrong that background checks are required for all of these sales. With more and more light shed on the truth of Internet sales and private sales with no background checks, they will not be able to get away with their deceptions. Gun laws matter. Lives matter. And so, gun rights extremists, what are your objections again to passing common sense gun laws? America has a right to know what your actual objections are. Not what the corporate gun lobby tells you. None of that fear and paranoia stuff about gun confiscation or your rights being taken from you. That's bogus. It doesn't work considering the facts. We, people who care about saving lives that is, need to know why you would object to saving lives with some simple measures that won't even affect you. Will it affect sales of guns? Perhaps. Is that the bottom line here? If you could save a life, why not? As a country we have decided that we want to save lives by requiring airbags and seat belts in cars. Did that raise the cost of cars? Most likely. Did it save lives? Yes. As a country we have decided to limit where people can smoke. Has it affected sales of alcohol in bars and restaurants? It doesn't look like it though that was the hue and cry of the bar owners when such laws were proposed. As a country we have decided that some products can't be sold or should be recalled because they are dangerous for children. Did that affect sales of some products? Likely. 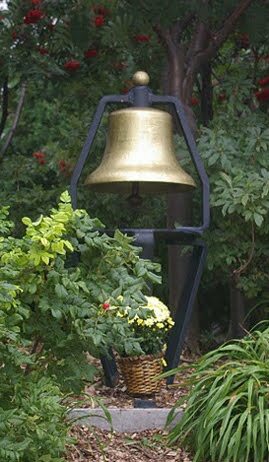 Did it stop us from doing the right thing? No. One person died and nine people were injured in six separate shootings in Milwaukee, Wis., overnight, including a 41-year-old man caught in the crossfire while working on a car and a 27-year-old man fatally shot after a fight. Six people were shot in five separate shootings within an eight-hour period in Cleveland, Ohio, early Sunday. Five people were shot outside a home on the west side of Detroit, Mich., Saturday, including an 8-year-old boy, a 16-year-old girl and three adults. A man feuding with township officials in Pennsylvania’s Pocono Mountains over living conditions at his ramshackle, trash-filled property killed three people at a municipal meeting — including at least one town official — in a rampage that blew holes through the walls and sent people crawling for cover, authorities said. The gunman, identified as 59-year-old Rockne Newell, randomly fired shots Monday night as he barged into the meeting, authorities said. He left long enough to get another weapon from his car and continued firing upon returning until he was tackled by at least one person and shot with his own gun, police and witnesses said. You just can't make this stuff up. It is a unique American experience and a gun culture gone wrong. What makes someone think they can barge into a town meeting guns blazing and start shooting people over junk? Is this 2013? This is the stuff of movies. Only it's real life and now 3 people are senselessly dead. And don't send me your articles, you gun guys who read this blog, about someone being able to stop the guy if they had had a gun. That is also the stuff of movies. In real life, people run for cover and adrenaline takes over causing the instinct to protect oneself by getting away from the danger. People crawled for cover according to the article above. The man took the meeting by surprise and the reaction was to get out of the way. The man barged in. Chaos ensued. That's what happens in these kind of shootings. The answer is not to arm more people in public places. The answer is to keep people like this from having guns in the first place. The answer is to change the gun culture so people don't think that using their guns in revenge is a good idea. This just does not happen ( or not usually) in other countries where guns are not seen as the answer. They are not the answer. Guns are dangerous. People who own them too often use them in anger at a moment's provocation. When guns are easily accessible, they will get used. We have enough proof of that in this country to demand reasonable solutions. There are people who shouldn't have guns. There are people who shouldn't get to carry loaded guns in public. There are places where people shouldn't get to carry loaded guns. There are some guns that people shouldn't have for every day use. There are gun dealers who need to be more closely monitored. There are too many people who don't lock up their loaded guns. There are too many people who think they can shoot people over minor disagreements. There are too many mass shootings. There are too many every day shootings. Laws can change these things. A more sane gun culture can change these things. Passing common sense gun laws would send a message that we are serious about saving lives and that we are a country that doesn't tolerate shootings. As a country, we are better than the way things are right now. Let's get to work and make some positive changes to save lives. Pennsylvania authorities today praised two “truly heroic” men who tackled a man after he allegedly opened fire at a town supervisors’ meeting Monday night, killing three people and later saying he wished he had “killed more of them,” according to court documents. Bernie Kozen, who helped subdue suspect Rockne Newell, 59, told officials that during the struggle, the suspect yelled, “You took my property,” followed by an expletive, the documents state. Officials have identified Newell as the alleged shooter, who also left three people injured. Police say he had a long-running property dispute with the town. Newell showed up unexpectedly at the Ross Township, Pa., supervisors’ meeting in a rental car, approached the building from the front and allegedly began firing through a window with a Ruger mini-14 rifle. He passed through and office and toward the meeting room, allegedly firing 14 rounds. There were about 18 people at the meeting, police said. When he got to the meeting room, he allegedly fired several more rounds. Police said a total of 28 shots were allegedly fired before he left the building, grabbed a 44-Magnum revolver from his car and made his way back to the meeting room. That was when Kozen and Kresh took what police called life-saving actions. Authorities said they were not aware of any recent prior activity in Newell’s police record. They are aware of one prior arrest in the early 1980s for reckless endangerment, but they did not go into details. Records show Newell’s handgun was lawfully purchased “some time ago” and authorities are still looking into the rifle, police said. Right. He was mad that he didn't shoot more people? Nice. Shouldn't reckless endangerment dis-qualify someone for buying guns? I'm just asking. Note- folks at the town hall tackled the shooter, took his gun, and shot him to subdue him with his own gun. These folks were unarmed and yet were able to get the man's gun. That is the problem isn't it? A gun can be seized and used against it's owner. This is actually a pretty easy fix. If the goal is to increase the percentage of gun transfers undergoing a background check prior to the sale to prevent prohibited persons from gaining access. The simple answer is to open up the NICS system for citizens to use prior to making a private sale. There isn't any need to identify the firearm in this check because federal law doesn't have different standards of prohibited persons for different firearms. Gun control advocates commonly claim that 40% of gun sales don't go through background checks, yet 80 to 90 percent of the population are in favor of these checks. So doing this would result in an immediate increase in the percentage from the claimed 60% to 80 or 90. And if you introduce this bill, covering ONLY background checks and with no possibility of registration, it would leave whatever lobby groups are out there with nothing to object to. In fact, it was actually suggested by a Republican Senator from Oklahoma. Mark- I doubt it is an east fix, If it was, it would have been a while ago. It will be up to the professionals to decide if the idea is even feasible. It comes with complications, as has been discussed on my blog. You gun guys think this is the way to go. Who will monitor everyone who calls in? How will anyone know if the private sellers are legitimate? How will the guns be traced if there are thousands of private sellers calling in? This is no easy fix. Rather it's a way to avoid just having private sellers at gun shows go through licensed dealers. That is an easy fix and works in the states that have done it. Japete - why do you need to trace the guns if the point is to have a background check on all buyers? If the check comes back clean, then the person should be allowed to purchase the gun. Tracing guns has nothing to do with background checks. Also, what does it matter if the seller is "legit" or not? All that should matter is whether or not the buyer is a prohibited person right? Isn't that the point of the background check? The purpose of keeping records of sale on gun purchases is so law enforcement can trace crime guns. Good idea right? Why wouldn't we want to make sure the seller is legit? That is what the ATF is for. They monitor FFLs to make sure they are not allowing straw purchases or not reporting stolen guns. People's lives are at stake here. That should matter to everyone. As a guy who's been working to pass sensible gun laws for a number of years now I wish Mark's idea had been enacted as federal law way back at the beginning of the Internet. It's definitely worth a try. My bet is it would work quite well. Most gun sellers would do the background check because they are law-abiding and believe in the concept of background checks. And, given there would be no record of the transfer in any government office, bureau or agency, such a law would likely sail right through to passage. One feature I would like to see, providing it doesn't kill the bill, is that the seller be required to keep a printout of the background check they did. This printed record could only be used by law enforcement to research a particular firearm involved in a particular crime. It protects the seller in the event that a gun they sold/transferred is used in a crime and would help law enforcement catch gun traffickers.